William Blaine "Bill" Richardson (born November 15, 1947) is an American politician and a member of the Democratic Party. 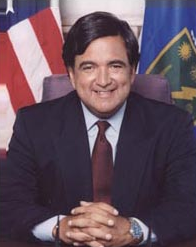 He has served as a Congressman, United States Ambassador to the United Nations, and U.S. Secretary of Energy. He was elected Governor of New Mexico in 2002. He was also chairman of the 2004 Democratic National Convention that nominated John Kerry for the presidency. Make no mistake, the point of cutting the personal income tax and the capital gains cut is to send an unmistakable message to business. Magers, Phil (2003-02-19). ""New Mexico cuts taxes to stimulate economy"". United Press International. Retrieved on 2006-08-21. Lewison, Jed (2008-08-28). ""Mocking McCain's Shoes and Flip-Flops"". Retrieved on 2008-09-21.